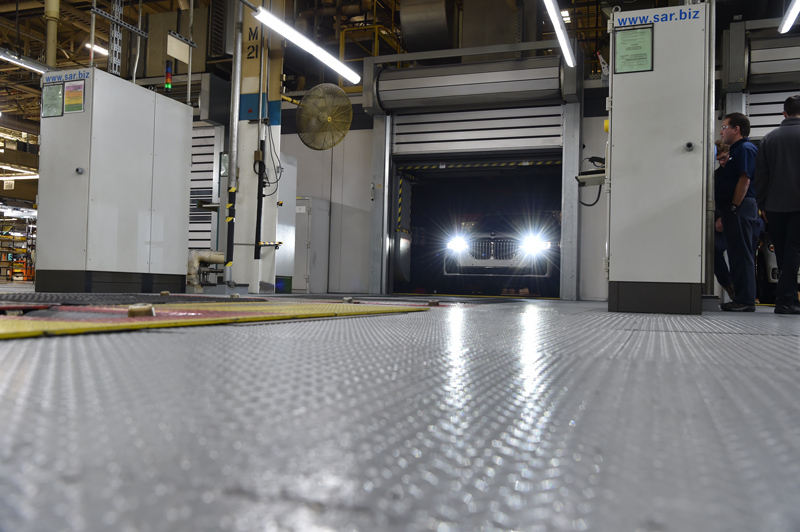 BMW Plant Spartanburg Provides Sneak Peek Of New X7. 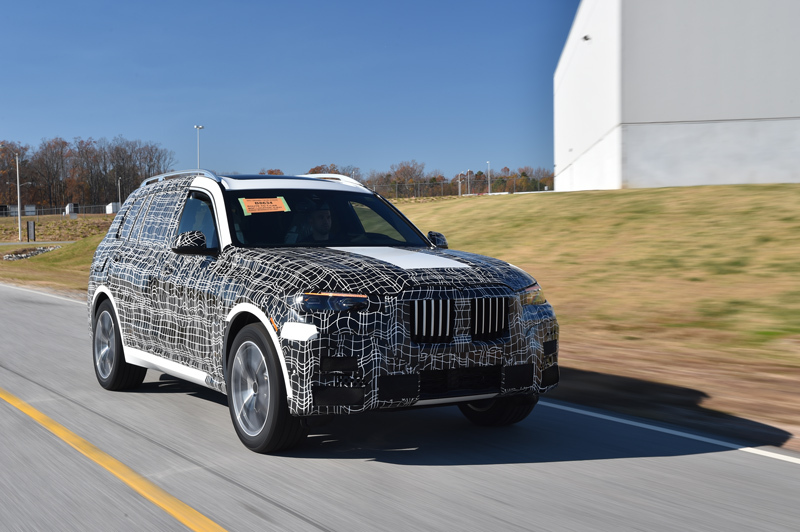 First came the announcement years ago that BMW would build a bigger Sports Activity Vehicle—the X7—at BMW Plant Spartanburg in South Carolina. Then came the inevitable spy photos of camouflaged X7 test mules. That was followed this year with the introduction of the BMW Concept X7 iPerformance at the Frankfurt Auto Show. BMW seems to be stretching out the news of the new X7 in an attempt to maintain interest in the impending range-topping X vehicle. 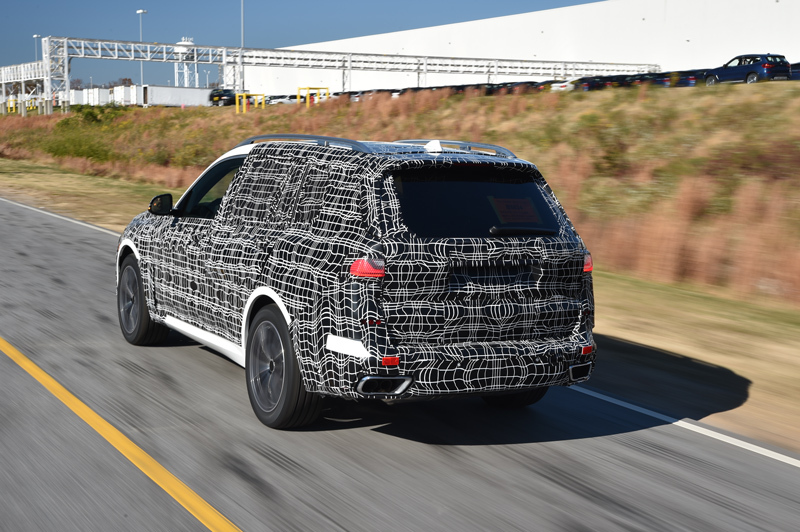 BMW Manufacturing has taken the peek-a-boo approach to a new level by giving us a quick look at pre-production BMW X7s on Spartanburg's assembly line. And they have given us a more specific window for the official launch of the big BMW: by the end of 2018. These test X7s are still camouflaged, but gone are the circles and swirls of BMW's older camouflage, replaced on the X7 with the linear black and white techno camo seen recently on the BMW i8 Life Cycle Impulse. It's also likely that some fake body panel covers are attached to further confuse design spies. 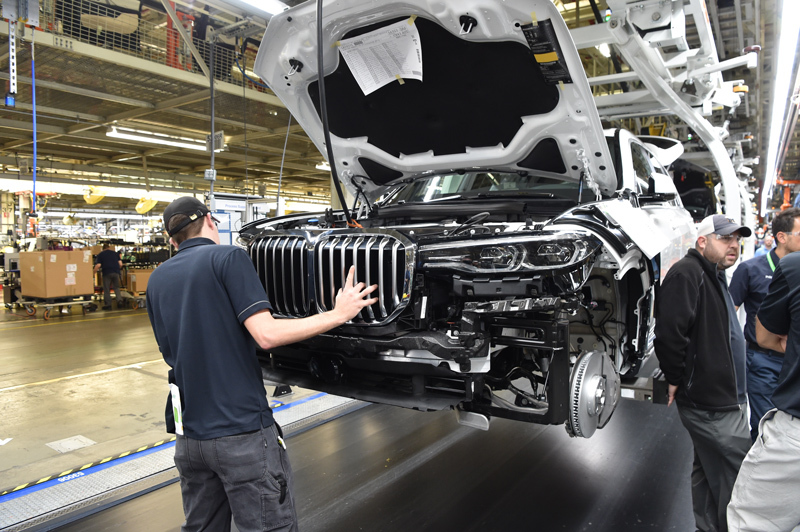 One thing that is very obvious from these factory photos is that the new X7 will have the largest set of kidney grilles in BMW's modern era. Pre-production versions of an upcoming model are used for testing, but they are also essential for training and qualifying factory workers on the specifics of the model. In the X7's case, it will be built on the same assembly line that currently produces the BMW X5 and BMW X6. The X3 and X4 are built in one of the massive plant's other halls. If you happen to be near the Arctic Circle in Scandinavia this winter, or cruising through Death Valley next spring, you might just see one or two of these strangely liveried beasts undergoing extreme weather testing. They will also be used for homologation registrations and endurance tests. BMW Plant Spartanburg produces four—soon to be five—X models for sale in the U.S. and 140 other countries. More than 411,000 X vehicles rolled out the plant's doors in 2016. That figure will be higher for 2017. 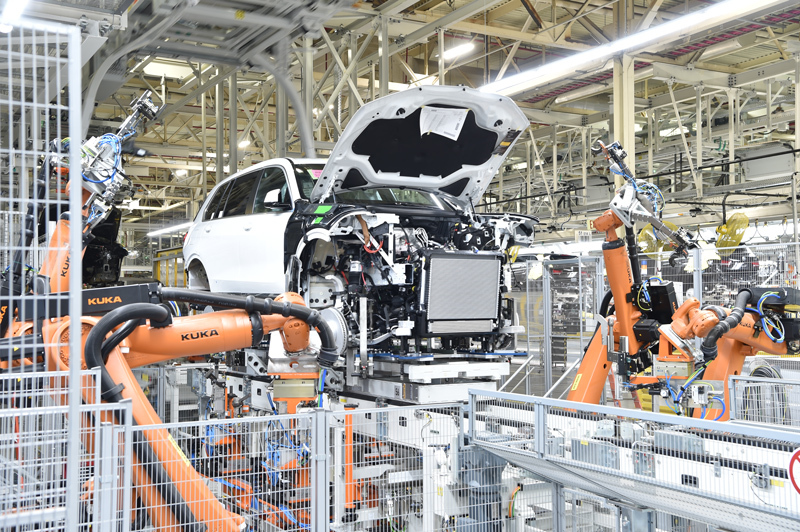 The plant's capacity is 450,000 units and it is BMW's largest factory anywhere in the world. All by itself, BMW Plant Spartanburg exports enough X vehicles to other countries to make BMW the largest vehicle exporter by dollar value in the U.S. 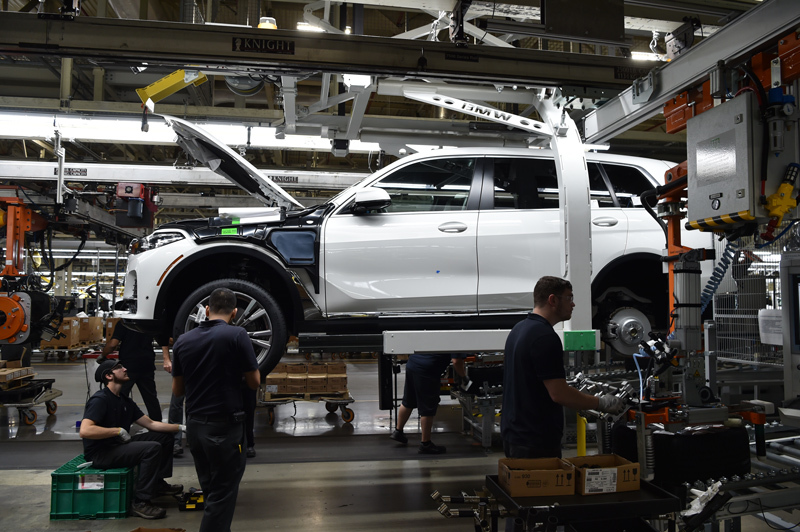 The plant employs more than 9,000 workers, with another 1,000 to be hired by 2021. Auberlen to Turner in 2019?